Knowing the state of online marketing is important in helping you keep your methodology updated. We have interesting online marketing statistics from the previous week that can help you look at your own business and analyze where you can improve and boost your SEO strategy. Only 20% of businesses factor in their objectives during data collection. The influence of Google+ on search rankings is increasing. While email is still the most useful marketing tool, only 22% of emails sent reach the inbox. Average ecommerce site speeds are becoming slower. Helping your clients tie in their marketing strategies to their business goals is a big business opportunity. In fact, only 20% of businesses tie in their data collection to their objectives. While 60% of companies claim they have a strategy in mind, only a small fraction succeeds in achieving business goals. Being able to offer targeted data collection and analysis solutions – and report the success your targeted marketing plan brings later on – will help you establish a name among the businesses not factoring in business objectives when researching and gathering leads and other market information. I’ve discussed multiple times how important Google+ is on your marketing campaigns, but let’s look at the numbers. A newly-released report from Searchmetrics shows that Google+ has the biggest impact on search results. It also shows that if the current growth of Facebook Shares and Google plus ones stays consistent, then Google will overtake Facebook in terms of social sharing by 2016. See the image below from Searchmetrics’ infographic for the stats and the average social media signals found on the SERPs studied. 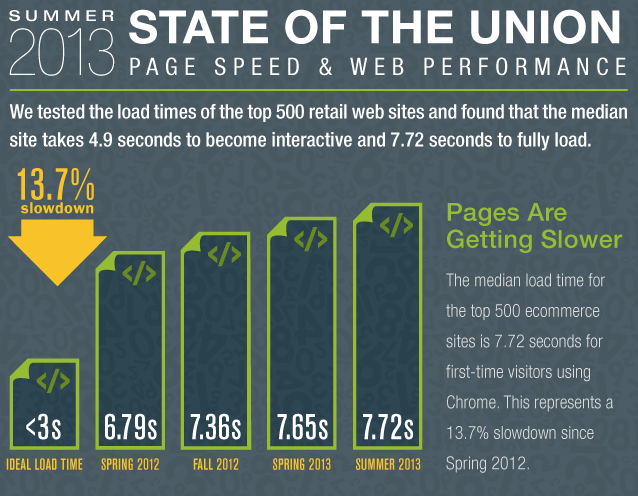 Radware’s latest infographic shows that the loading time for ecommerce pages are much lower than the ideal site speed. The average loading time for an ecommerce site accessed through Chrome this summer 2013 is 7.72 seconds, which is 13.7% slower than Spring 2012’s 6.79 seconds, and much slower than the ideal speed of less than 3 seconds. Ecommerce sites also take an average of 4.9 seconds to become interactive, which means many of these sites are losing customers because of loading time. 57% of consumers say they will abandon a page if it does not load after 3 seconds. It’s no secret that the offering of marketing agencies are becoming more diversified. Working with separate agencies is difficult for businesses. 52% of agencies now offer a complete mixture of online marketing solutions – a big leap from 2012’s 25% and 2011’s 42%. If you’re not yet offering complete digital marketing suites, you’ll be quickly left behind – only 12% of agencies today focus solely on SEO, while only 7% focus solely on paid search. The good news is that all of our partners already receive a complete host of competitive SEO packages, web design, social media, local search, paid marketing, and other digital marketing tools and solutions. Our product suites allow us to successfully address any online marketing demand your client may have when they see these statistics. Talk to your account manager today for more industry updates and keep checking our blog for more news and tips. Sign up today if you’re not our partner to talk about the state of your marketing strategy and to find out how you can improve your methodology.